(Bloomberg) -- The Federal Reserve has handed Egypt another reason to proceed with what could be the world’s deepest series of interest-rate cuts. “Domestic demand is fragile, non-food inflation is low and globally central banks are shifting to an easing bias,” he said. Most economists surveyed by Bloomberg predict the central bank will cut by a percentage point. Five analysts see the benchmark staying at 15.75 percent. The central bank is still a long way from unwinding rate increases that it deployed to steady the pound and battle inflation after floating the currency in November 2016. While price growth has since stabilized, it accelerated for a second month to an annual 14.4 percent in February on the back of rising food costs. Egypt is one of the few nations still lowering official borrowing costs. Ghana and India unexpectedly cut rates in recent months. On Tuesday, Nigeria’s central bank surprised by reducing its benchmark for the first time in more than three years by half a percentage point. The Arab world’s most populous nation will likely see more “inflationary waves” in the coming months with the onset of the Muslim fasting month of Ramadan and the ensuing holiday as well as the repricing of 95-octane gasoline in April, according to Esraa Abd Al-Majeed, senior economist at Shuaa Securities. “Although the recent inflation hike was mainly driven by volatile items, we see core inflation has picked up as well,” said Al-Majeed, who predicts that rates will stay on hold. A surge in the pound is helping keep price pressures in check. 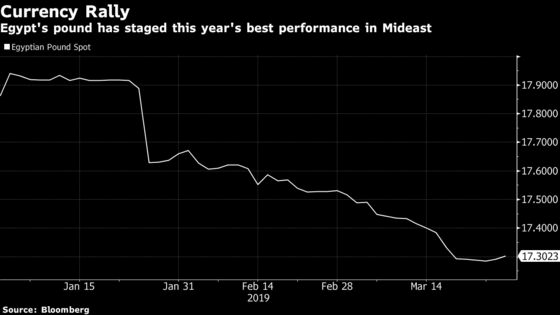 The Middle East’s best-performing currency this year is trading near its strongest level in two years. It has gained over 3.5 percent against the dollar since the start of 2019. Egypt’s currency is benefiting from investor appetite in local debt. Inflows rose to $15.8 billion in February, offering officials some solace after a selloff in emerging markets last year prompted about $10 billion in outflows. 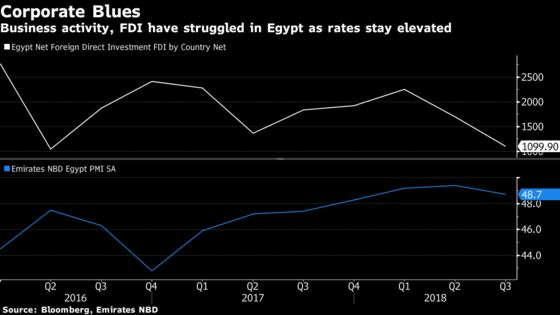 “Rates will be down in support of the debt control strategy and given that foreign investors continue to be super interested in Egypt’s treasury investments, in light of a stronger exchange rate and an attractive carry trade,” said Radwa El-Swaify, head of research at Cairo-based Pharos Holding. Monetary stimulus is also needed to revive growth among Egyptian firms and attract foreign direct investment. Business activity in Egypt’s non-oil private sector slipped in February to its lowest level since September 2017. Adding impetus is the need act ahead of a new round of planned fuel subsidy cuts by the end of the current fiscal year in June. “Relatively stable core inflation and stronger capital inflows, combined with our view that the Central Bank of Egypt may want to loosen policy before upcoming subsidy cuts, means that an interest-rate cut seems more likely than not,” said Jason Tuvey, senior economist at Capital Economics.